Dunstan Multi-Ultra provides the vitamin and mineral intake necessary for optimum health, vitality and performance. Horses fed pasture alone or low levels of supplementary feed may not be obtaining their daily requirements for essential vitamin and minerals from these feeds alone. 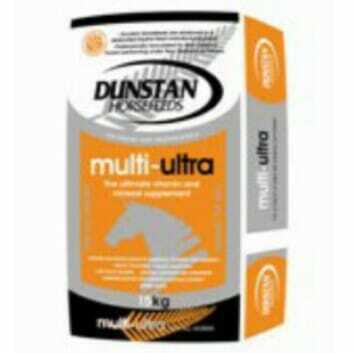 Dunstan Multi-Ultra provides the vitamin and mineral intake necessary for optimum health, vitality and performance. Multi-Ultra contains a full vitamin and mineral profile including Organic Selenium and Chromium, natural vitamin E, mannan Oligosaccharide and Aluminosilicate Clay. Ideal for’good doers’ which require a vitamin/mineral supplement to balance pasture-only diets. Ideal to ‘top-up’ nutrients if you are feeding below the recommended intake of a complete feed. Add to straight grains to properly fortify the ration and ensure nutrient requirements are being met. Soya Bean Oil, Wheat By-products, Molasses, Salt, Limestone, Agrimos, Zeolite, Live Yeast, Lysine, Methionine, Chromium, Flavouring, Organic Glycinate Trace Mineral, Vitamins. Nutrient Composition – per 500g of Multi-Ultra (as fed). Multi-Ultra is formulated to meet horses daily requirements for trace minerals and vitamins when fed at the rate of 500 grams per horse per day and ponies 200-400 grams per day. 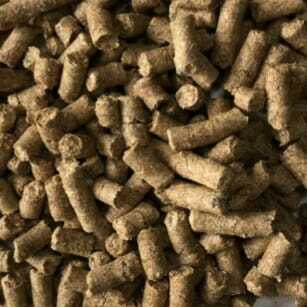 If mineralised proprietary feeds are being fed at amounts between 1kg-2kg per day, the feeding rate of Dunstan Multi-Ultra should be reduced to 200 grams per day. Do not feed Multi-Ultra as a full horse feed or in addition to proprietary mineralised feeds being fed at rates greater than 2kg per day. Do not feed to sheep or pet lambs as it contains copper at high levels.